Recently I wrote about the issue of the Professional Standards Authority (PSA) Accredited Voluntary Registers. (AVRs). Specifically, the registers that are in place for the voluntary regulation of counsellors and psychotherapists. I highlighted the problem with the fact that although they are there as a measure of public protection, the onus is on the public to ensure that their therapist is on an AVR and certainly most of the members of the public I ask are not aware of this scheme. "Most people looking for a counsellor don't know about the AVR scheme. So my first question is, I'd love to know who can change this and how." Thank you for your efforts to raise awareness of Accredited Voluntary Registers in counselling and psychotherapy. 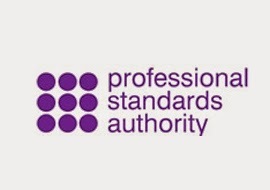 The Professional Standards Authority respects your view with regard to statutory regulation, and we agree that public awareness is essential to the success of the accredited registers approach. We note that on your blog, you raise a concern about public protection – if a practitioner was removed from a register but continued to practice, a member of the public would have no way of knowing. As you know, we require organisations holding voluntary registers to publish these decisions, but this only protects the public if people check the register and ask for practitioners on accredited registers. The Authority believes that the most effective way to raise awareness of voluntary registers is to disseminate standard messages to the approximately 53,000 registrants of 13 AVRs to use in their interactions with members of the public as well as health and care professionals. These have been provided to registrants by the organisation holding their accredited register. In addition to tapping into the awareness raising ability of registrants, the Authority has an active stakeholder education programme and has ensured that information about the scheme is available to the public through information sources like NHS Choices. News and updates on the scheme have appeared in NHS publications such as the NHS England’s CCG bulletin, or the Chief Nursing Officer’s bulletin. The Authority is working to improve the accessibility and visibility of information about the scheme and will continue to promote the scheme. The Authority has a communications plan in place to raise awareness of the scheme and it would be content to discuss with you. Although I am impressed with their clear vision for raising awareness of the AVRs I think there's a long way to go. A few weeks ago I noticed that NHS Choices don't mention PSA AVRs at all on their pages on counselling and psychotherapy. This is hardly a successful raising awareness of the scheme by NHS Choices. Closer to home, I was told back in June by a fellow therapist that he had gone to his GP surgery in Exeter to discuss his concerns about the Palace Gate scandal with the practice manager who promised to alert the surgery staff and notify the new practice manager who was due to succeed him soon. About 10 days ago another therapist went to see the same surgery and asked the new practice manager about his awareness of the PGCS scandal. He had no idea of it and worst of all, the practice nurse pulled a leaflet out of her bag and said "We send people there all the time". Palace Gate also known as Phoenix Counselling is an agency that has no membership of any regulatory organisation let alone an AVR and that is run by therapists who have been struck off the BACP twice and claim that 59% of their clients are signposted by GPs. There seemed to be no awareness whatsoever of the need to advise patients that the onus is on them to check that there therapist is on an AVR. Worst of all, NHS patients are still actively being encouraged to go to an agency that has been exposed in the national press for unethical practice. I telephoned my own practice manager who I assumed would be well versed in the situation seeing as I had made several trips to see my GP around issues of stress that the bullying and intimidation I had encountered in raising the complaint against PGCS. My GP was well aware of the outcome and I showed him the statement prepared by 27+ local counsellors. However, the practice manager again knew nothing of the matter. She has been helpful since then and I am now in the process of disseminating information regarding the PSA AVR scheme for Devon GPs. I will continue to liaise with the PSA regarding the education of all concerned about the existence of the AVRs and will do what I can. I am also dedicated to pushing for regulation (preferably via the existing PSA scheme) and will continue to work away on that. I would like to be part of a profession that acknowledges it's shadow side and can take care of those that take advantage of and exploit their clients. The way I experience it, at the moment, there's nothing to stop that. As for any therapists or referring agencies reading this - are you taking responsibility for helping protect clients by spreading the word regarding AVRs? From your post on the PSA I understand you are fairly in accord with basics of PSA accreditation; but you would want it to become a compulsory register? Would you consider yourself to be a therapist who subscribes to the medical/biological model of mental health? The reason I ask this is because it seems that the PSA subscribe to a medical/biological/ model of mental health. Many practitioners operate from a non-medical perspective (perhaps including yourself). Therefore it seems the PSA are excluding many therapists whether it is a voluntary register or becomes compulsory register. This situation is detrimental to ideals of embracing diversity and equal opportunities. Would you agree? Thank you for your comment Tristan. Please would you be able to tell me more about the PSA's medical model of mental health? If the registers are run by individual bodies such as the BACP and simply overseen by the PSA how would this lead to the PSA excluding therapists? I was actually hoping (as you seem to have a lot of knowledge about the PSA) you could confirm (or not) my idea that the PSA is subscribing to the idea of a medical/biological model of mental health (e.g. mental health=physical health analogy). Is this a model you subscribe to? Is this the model that the PSA subscribe to? You say "...the registers are run by individual bodies such as the BACP and simply overseen by the PSA..." What exactly does this mean in terms of PSA membership/validation/management etc? I recommend you look at the PSA website. As far as I know, 'the medical model' is not part of their way of handling the AVRs. The PSA are very approachable so if you have concerns about the way they are running the AVRs you could ask them directly. The very straightforward answer is that the PSA currently regulates occupational therapists, arts therapists, clinical psychologists and social workers - none whom operate according to the medical model. They even took the (in my view, ludicrous) step recently of giving AVR status to the Society of Homeopaths, who don't even follow basic scientific principles, let alone the medical model. I have looked at the PSA website. It is clearly imprinted into their "constitution" the analogy of physical health/treatment=mental health/treatment. I am surprised that you do not realise this. Mind you, I think as an organisation, as the other poster has indicated the PSA is quite a confused and ideologically shakey organisation ( as is HCPC who PSA regulate; psychologists etc, but not under AVR). Perusing the literature available to the public about the PSA, it seems quite concerning the structure of the organisation re their power, salary structure, staff quotas. Re their remit of so-called protection of the public, it seems this is an empty vessell to carry other motivations. I see it costs an organisation 13000 pounds to.join and 9000 to renew yearly. Quite a motivation for a organisation with shakey foundations. Further, the ideological and financial.implications of PSA seems to imply a very complex form of management; far from a situation of the registers being "simply overseen" by the PSA. There will also be the increased fees for membership to be part of the PSA and their questionable function and ideology.